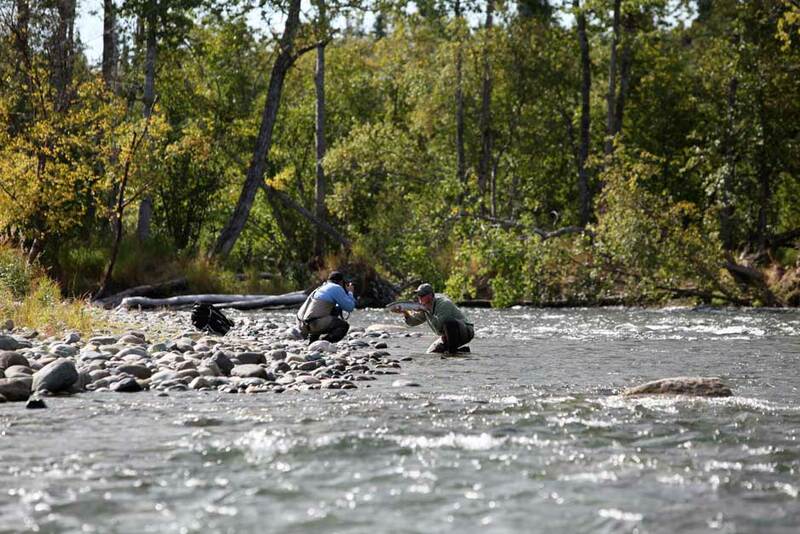 Rapids Camp Lodge, Alaska | Tailwaters Fly Fishing Co.
Rapids Camp Lodge is located seven miles upriver from King Salmon, Alaska on the Naknek River. 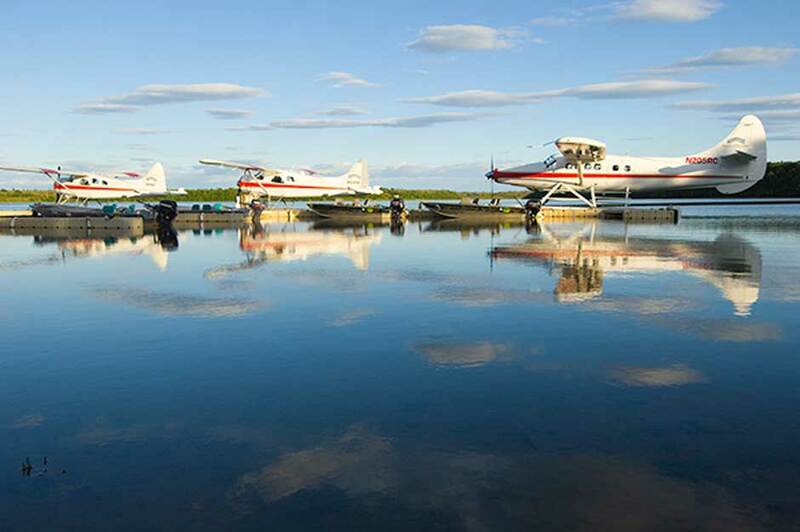 Guests travel commercially to Anchorage, AK and connect onward to King Salmon (AKN) on the lodge’s private Cessna airplanes (Anchorage-King Salmon flight included in trip cost). Most guests opt to spend Thursday night in Anchorage before pushing onward to King Salmon on Friday. Rapids Camp Lodge targets virtually all species of fish in the Bristol Bay region that can be caught with rod and reel, including trophy rainbow trout, all five species of Pacific salmon, arctic char, dolly varden, grayling, northern pike, lake trout, halibut, ling cod and other saltwater species. Rapids Camp Lodge’s daily fly out program to different rivers, lakes, and even saltwater ensures that anglers experience a wide variety of the best fishing Alaska has to offer. Choosing a date to fish anywhere in Western Alaska depends upon which species of fish you would like to target. Fishing is excellent all season, but the conditions and species available vary from month to month and may impact when you decide to visit. All months are excellent for viewing wildlife. (See WHEN TO GO for more details). Is Rapids Camp Lodge Right For You? Rapids Camp is a great option for hard-core anglers as well as mixed groups looking for the “everything Alaska” kind of trip. While trips here center around fishing as the dominant activity, there is no better way to experience all of western Alaska’s scenery, landscapes and wildlife than on a fly-out fishing trip. It is a great option to consider for anglers of all ages and skill levels, and for both conventional tackle and of course fly fishing. 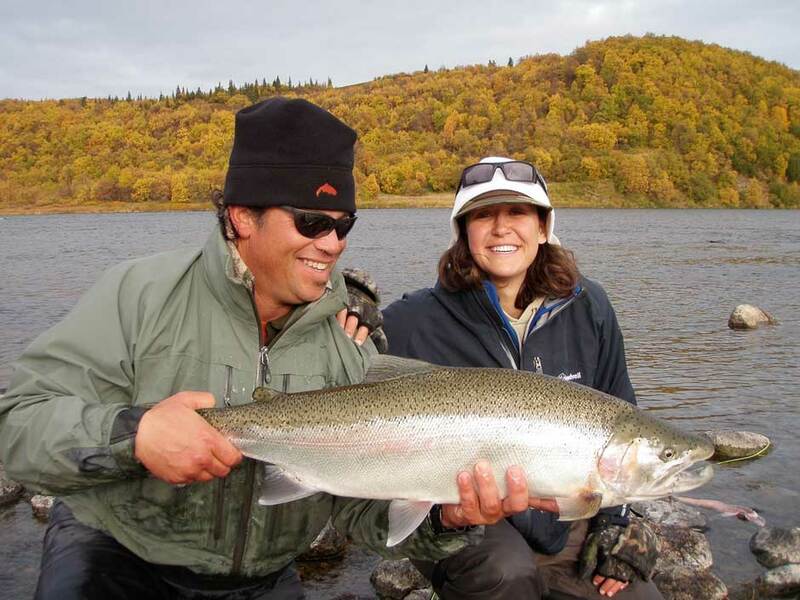 Rates are inclusive of all guided fishing and daily fly-outs, accommodations, meals, use of fishing equipment and waders/boots, and round trip air service between Anchorage and King Salmon, Alaska. Additional expenses include but are not limited to airfare from your home to Anchorage, hotel accommodations in Anchorage when applicable, gratuities and bar tab. (See RATES for details). Ideally located in the heart of Alaska’s best trout and salmon fisheries just outside of King Salmon, AK, Rapids Camp Lodge has earned the reputation as one of the premier Alaskan fly-out operations. 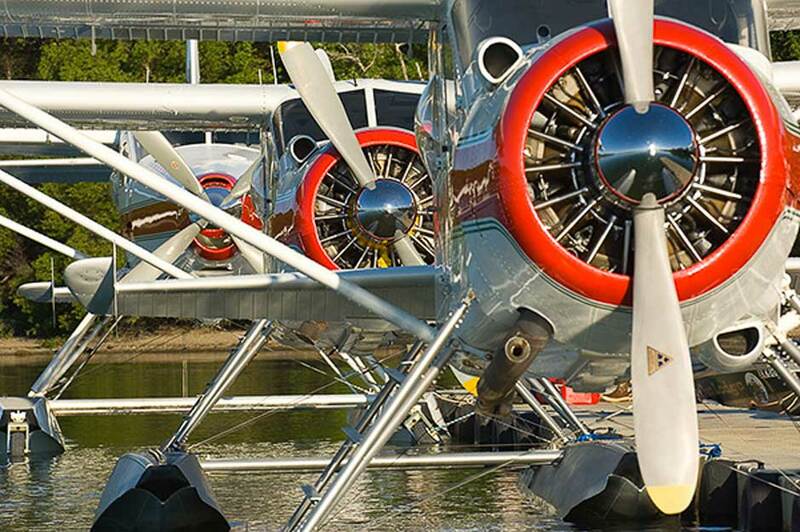 Rapids Camp Lodge operates four floatplanes, including three de Havilland Beavers on floats and turbine powered de Havilland Otter. Located on the world-renowned Naknek River, the lodge can provide all the fishing gear, waders, flies, and tackle required free of charge. Comfortable accommodations in eight double occupancy bedrooms with private baths plus a small cabin allow a maximum of twenty guests. The ten-acre riverfront property boasts incredible food, a cozy great room with high-speed wireless internet, satellite TV, and a lively bar. Their fishing program is founded on an endless array of angling options for all species of salmon, char, trout, and more with the use of the largest fleet of aircraft in the business. With four planes and a maximum of twenty guests per week, the aircraft/angler ratio is among the best in Alaska. They are also the only fly-out lodge with a legitimate saltwater program for halibut, salmon, ling cod and other species at Geographic Harbor. Rapids Camp also provides round-trip air transport between King Salmon and Anchorage on two private planes – allowing guests to avoid commercial travel to King Salmon. 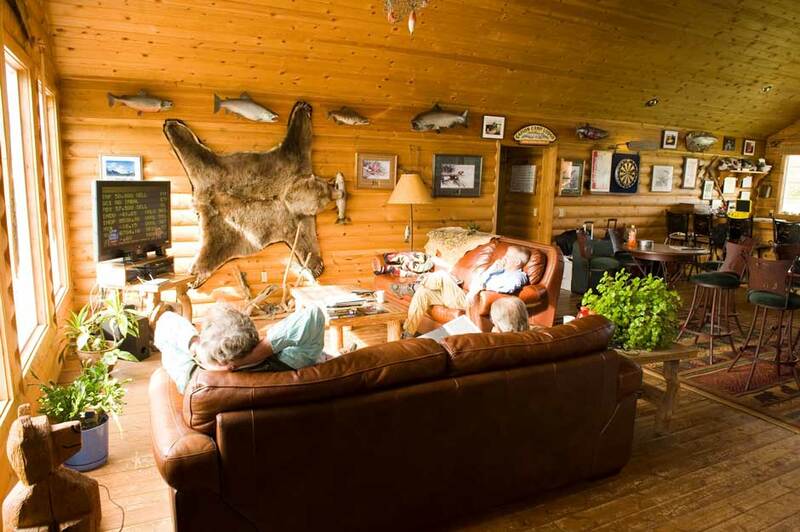 Rapids Camp Lodge is one of our most popular Alaskan fly-out fishing lodges. It is located upriver from King Salmon on the Naknek River, in the Bristol Bay area. The rivers and streams in the area are world renowned for their runs of wild Pacific salmon and thriving resident populations of rainbow trout, arctic char, arctic grayling, northern pike, lake trout and dolly varden. Guests fish the Naknek, a world famous trophy rainbow trout destination fishery, and with the use of the lodge’s four aircraft, hundreds of miles of rivers and creeks around the lodge. Many of those are within nearby national and state parks and federal wildlife refuges which have little or no human development. Western Alaska is the last American frontier in the world of fly fishing, and no Alaskan fishing operation is better than Rapids Camp Lodge for experiencing the wonders of this amazing wilderness. Owner, Jerry Shults, purchased the property home to Rapids Camp Lodge from the U.S. Air Force in 1996. After building the lodge on the grounds of the old officer’s retreat, RCL has become one of the most complete and reputable fly-out operations in Western Alaska. Its family atmosphere, superior food and service, first-rate equipment and airplanes, and a world-class roster of tenured guides and pilots combine to create the greatest Alaskan experience available. Guests at Rapids Camp fly out daily aboard one of lodge’s four aircraft to remote streams and rivers in the area. With three de Havilland Beavers on floats, a de Havilland turbine-driven Otter on floats and the option to convert one of the Beavers from floats to tundra tires, Rapids Camp guests are best equipped to access the area’s remote fisheries and wildlife viewing areas. In the event that weather precludes flying, the incredible rainbow trout and salmon fishing of the Naknek River is right out the front door. In fact, many guests throughout the season forgo a fly-out day for longer fishing hours and the convenience of the Naknek. The Naknek is home to some of Alaska’s largest rainbows — many exceeding 30 inches – and tremendous runs of all Pacific salmon species. Rapids Camp guides are well versed in the program and many have over a decade of experience fishing, guiding, and exploring Alaska. 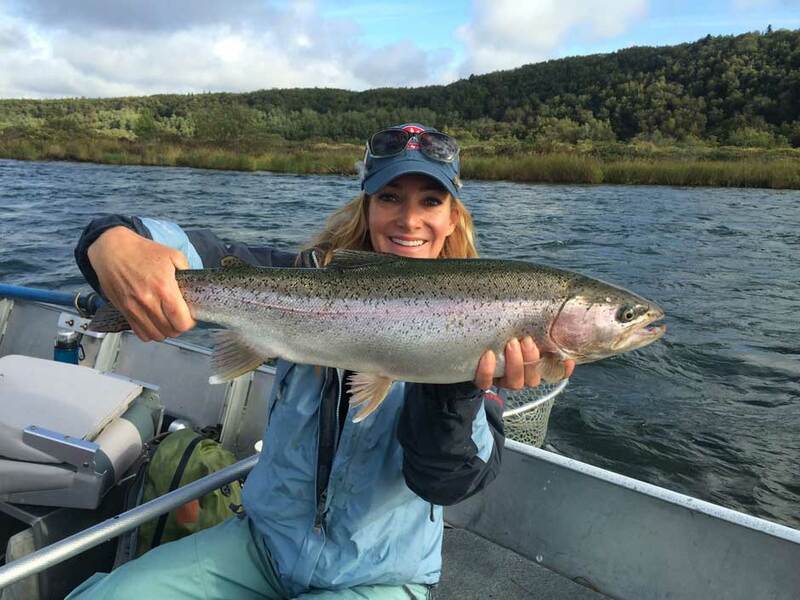 Nearly all the guides grew up fishing the famous salmon and steelhead rivers of the Pacific Northwest – and are well kept professionals with excellent manners and instructional ability. Whether you have your children in tow or are looking to learn to cast a spey rod, Rapids Camp guides can handle guests of all skill levels, ages, genders, and levels of physical fitness. Rapids Camp maintains custom jet boats on the Naknek and many smaller jet sleds stashed on various rivers throughout the region including two boats on the Kvichak and three boats on the Nushagak. Float trips in comfortable rafts are also part of the weekly routine depending on the season and anglers’ interests. Southwestern Alaska offers an incredible diversity of fishing opportunities with eleven freshwater gamefish species available throughout the season. In addition to the traditional freshwater fisheries, Rapids Camp offers a saltwater program in beautiful Geographic Harbor and the waters around Kodiak Island. Guests may venture down and try their hand for halibut, salmon, lingcod, rockfish, yellow-eye, and many others. 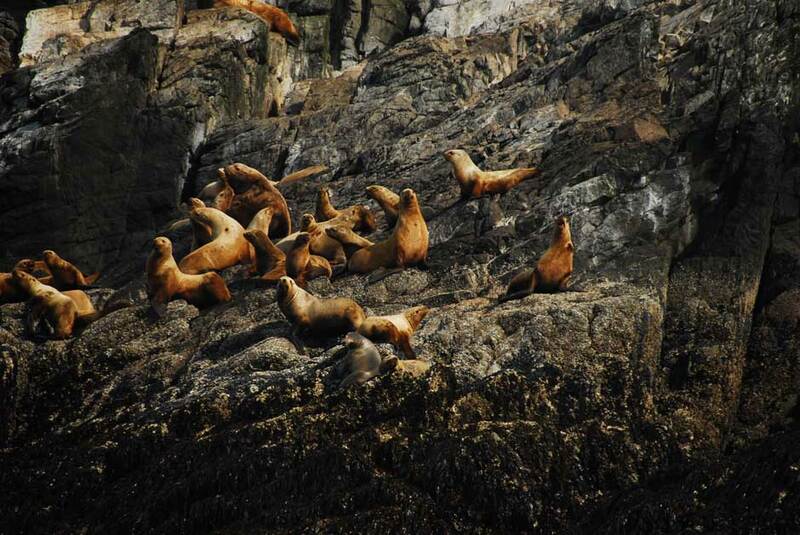 Geographic Harbor is also a wonderful spot for viewing bears, humped back whales, orcas, seals, sea lions and tons of other marine and bird life. Anglers and guides typically take the turbine otter down to the coast where modern 26’ closed cabin Hewes Craft boats are moored. It is a gorgeous flight over Katmai to the saltwater bay, and well worth taking a day off from the river. This is a wonderful addition to the unique program, and is really something for everyone to consider. Rapids Camp only conducts the saltwater program when seas are calm, and this is a great side trip for families as well as those interested in witnessing a part of Alaska not frequented by other lodges. Geographic Harbor (or “Geo”) is one of the prettiest places on earth! 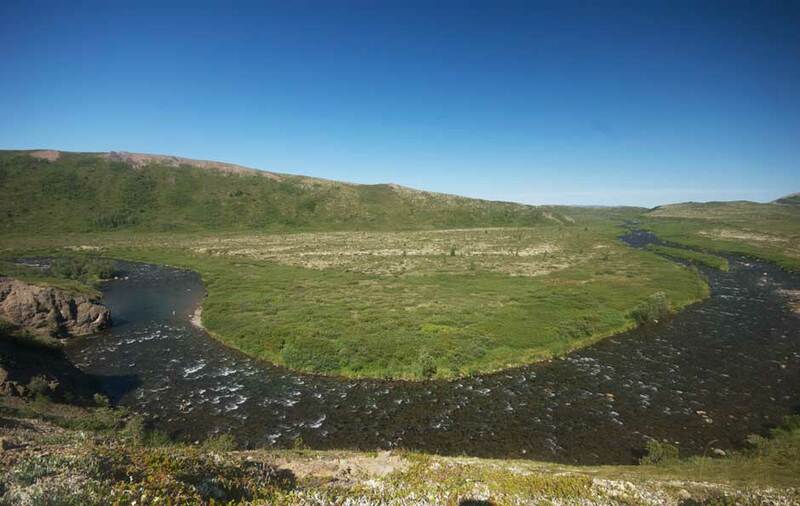 Rapids Camp visits nearly fifty of Bristol Bay’s best river systems. The following is a brief description of the most popular spots — but the four airplanes (3 on floats and 1 on tundra tires) provide access to many other lesser known rivers that can seasonally fish off the charts and don’t have much competition from other fly-out lodges. The Naknek is the home river. It is big water for big fish! The lodge is situated on the Naknek approximately fifteen minutes from the King Salmon Airport just downstream of the rapids section of this massive drainage, and approximately ten miles downstream from the outlet at Naknek Lake. The river in front of the lodge is very large allowing for easy float plane access. It boasts an enormous salmon run and some of the largest rainbows in Alaska. Upstream of the lodge a few clicks, the river chokes down in width and becomes more wade friendly from shallow shelves and along the willow lined banks. 22-28 inch rainbows are par for the course on the Naknek, with many 10 pound + specimens coming to hand throughout the season. Early season smolt runs offer incredible rainbow opportunities as huge trout will move out of the lake busting bait balls. The middle parts of the season offer consistent bead/egg fishing for bows, and the salmon runs for all sub species are enormous in “The Nak.” Experienced anglers from all over the world make a fall pilgrimage to the Naknek and Kvichak rivers during the latter half of September in search of the largest rainbows on earth. Starting around September 20th, “The Swing” turns on when the largest lake run rainbows enter the river system. This event allows anglers the world’s best chance for catching multiple 30+ inch rainbows. “Steelhead style” fishing with two-handed spey rods is most effective while wading the gravelly shallow shelves and banks of this stunning freestone. Dumping out of Lake Illiamna (the largest lake in Alaska), the Kvichak is also one of the most famous rivers in the world for harboring huge rainbows. 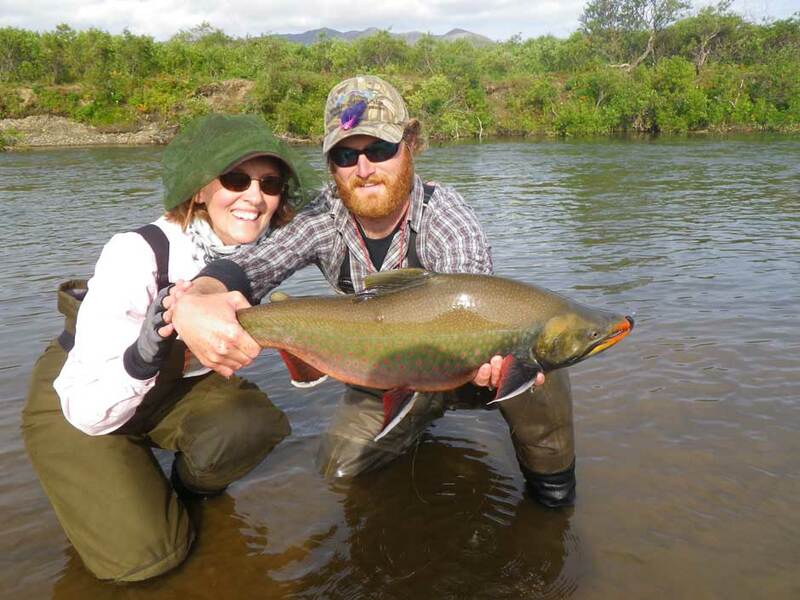 The Kvichak is also big water, and a must-do river on any fishing trip to Alaska. Rapids Camp keeps two jet boats on the “braids” section of the river, a renowned stretch of the river that lends itself to easier wading opportunities and the ability to sight cast to huge rainbows in the 25-32 inch range. The Kvichak also has a similar run of chromed up rainbows during the annual June smolt migration as well as a September swing for huge steelhead-like rainbows in the main stem. Tributaries of both these lake systems hold huge char; and RCL regularly has guests catch 35-inch trophies — oftentimes several fish over thirty inches a day per angler. Unlike many places where char of these proportions are found, RCL is within easy striking distance. Ugashik is accessed by float plane on one of the lakes and anglers easily wade the one mile connecting stream loaded with thousands of char feeding on salmon roe. It is like shooting ducks on the pond and a really fun distraction from the hard-core rainbow fishing. Moraine Creek flows 15 miles from Spectacle Lake to Kukaklek Lake. Funnel Creek is its major tributary. The Moraine has the reputation of having some of the biggest rainbow trout in and around Katmai National Park. This stream consistently produces the largest trout of the season outside of the Naknek and Kvichak, with some fish exceeding 30 inches. Views of surrounding glacial valleys, wildlife, and river scenery also help make the Moraine one of the most popular spots for RCL guests. The Kulik is one of the most beautiful fly-out destinations in the Katmai region. Surrounded by mountains, the river is a little more than a mile long and drains Kulik Lake into Nonvianuk Lake. Kulik is a great fishery providing good numbers of aggressive trout ranging to 25 inches, with the average fish 17-18 inches. During peak times Kulik can be a little crowded, but on most days, the river is generous with fish, elbow room, and wilderness scenery. Rapids Camp Lodge operates unique float trips down the Kulik. It is a high volume style of fishing with medium sized fish, but is a great place for those looking to rack up the easy numbers. The Grandaddy of all Alaskan King Salmon rivers. RCL keeps three boats at the Nushagak for anglers who want to try their hand at the largest of the salmon species. Getting there is simple, a spectacular quick jump in the Beaver. The Big Ku is a wide-open, larger river with beautiful views of Kukaklek Lake and surroundings. The Big Ku is a great early June trout fishery where trout lay in wait ready to attack clouds of salmon smolt as they make their migration to the ocean. Trout fishing remains good until hordes of adult sockeyes ascend the Lake in early July. Rainbow fishing is replaced by excellent sockeye fishing. Rapids Camp can also access certain spots that offer a unique opportunity for early season anglers to wade fish swinging flies for king salmon. Tucked down the Alaska Peninsula, the “Smokey” gets a generous run of Kings without the corresponding number of anglers. Small, clear and intimate is a rare find when it comes to the King of salmon. Perfect for the angler who wants to experience great fly fishing for kings but not have to get stuck without options to fish for other species. The perfect day trip to catch a king on a fly. Flying along the coast and seeing the fish before you land just up the beach is the ultimate in fly-out fly fishing. Rapids Camp Lodge visits all the most prolific coastal drainages of the Alaskan Peninsula. The wheeled beaver allows this access to some of Alaska’s most remote fisheries filled with freshest salmon possible as they enter the river system from the salt. Other than a few necessities such as sunglasses and a rain jacket, Rapids Camp Lodge can provide all the necessary gear for their guests. The lodge maintains high quality rods, reels, waders, etc. at no extra charge. All flies, leaders, tippet and other tackle are also included in the trip cost. You can show up at RCL with next to nothing and expect to be fully outfitted upon arrival. Following a long day on the water, Rapids Camp guests relax and enjoy exceptional accommodations and amenities. The traditional log cabin style buildings are tastefully decorated and tailor made for a luxurious Alaskan wilderness experience. The lodge sits on a bluff perched above the Naknek, with the floatplanes parked at the pier right out front! The lodge houses their guests in eight spacious double occupancy bedrooms with private baths. The ten acre property sits directly on the banks of the Naknek River. Meals are taken in the lodge’s main building adjacent to the comfortable great room equipped with satellite TV, open bar, and high speed wireless internet. Compared to other wilderness fishing lodges, RCL has a huge advantage in being connected to town by a road. This accessibility to daily flights from Anchorage allows their world-class chefs to pamper guests with meals of the freshest ingredients. They serve only the finest meats and wild game (duck, Kobe beef, venison, etc. ), have access to the freshest salmon and halibut on earth, and have fresh produce delivered weekly. The lodge employs two full time professional chefs that turn out phenomenal meals from fresh seafood to prime rib. Honestly, the meals at Rapids Camp Lodge are perhaps the best we have enjoyed at any fishing lodge . . . anywhere. Desserts are delicious, the bar is always well stocked, and the wine selection is always top notch. Guests help themselves to local draft beer from the bar and the lodge has several excellent California, Chilean, and other imported wines as part of every meal and cocktail hour. While out for the day you will be fed a hot shore lunch of salmon (weather and bears permitting). If you are rafting or hiking, the chefs will send along a delicious picnic lunch. If you are fishing on the Naknek, expect a nice hot lunch at the lodge. Other amenities include a private reading room and a workout facility. There is a full time professional masseuse on staff at the lodge for evening relaxation after a long day on the river. Rapids Camp Lodge is as nice as any fly out fishing lodge in Alaska, and we encourage our customers to understand this is not a “roughing it” kind of experience. Even the most high maintenance clients of any gender will be comfortable in the lodge’s facilities. Cohesive parties of four may request staying in the lodge’s “owner’s cabin” just up the hill from the main lodge building if available. This two bedroom cabin grants guests a little more privacy and square footage as well satellite TV and a small kitchen. The lodge capacity is traditionally 16 anglers per week. 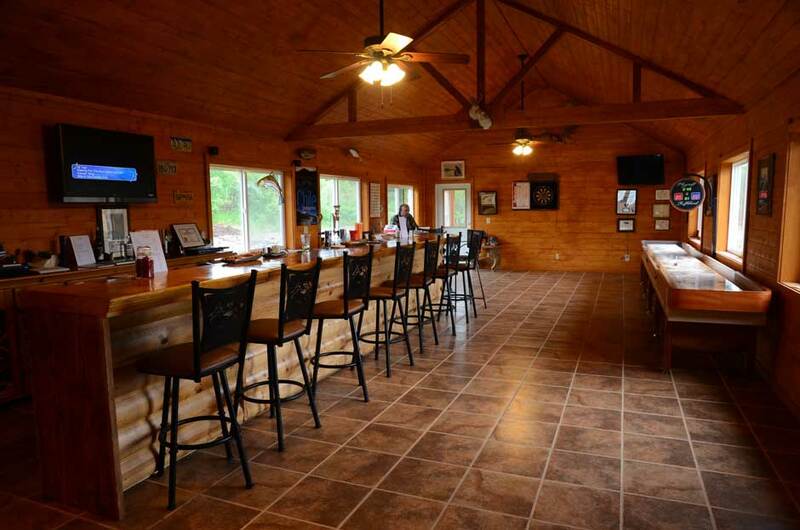 However, cohesive parties of four may have access to the lodge’s “owners cabin.” If guests are staying in the owners cabin, the lodge will operate with 20 anglers per week. RCL’s three de Havilland Beavers on floats and one Turbine Otter on amphibious floats ensure great trips. Unlike most other operations in Alaska, a plane for every 4-5 guests means there is always a seat for guests at Rapids Camp. No need to wait your turn – just hop on the plane with your guide and go. Enough cannot be said about this fleet of airplanes! The Beavers and the Otter have all been stripped down to bare metal and completely restored to a like new condition. As with all aspects of the RCL program, Mr. Shults has spared NO expense. We are confident that no other lodge has planes quite so spectacular. With the only heated hanger in King Salmon, RCL’s planes are kept immaculate and maintained to the highest standards. Originally known as the “King Beaver” the Otter is based on the same principles, but larger in size, than the three Beavers. The Otter is one of 26 planes in the world retrofitted with a 1000hp Garret Turbine engine to increase performance and range. Set up to fly with instruments, there is no safer way to get around Alaska. It also can accommodate up to 10 passengers comfortably allowing for large groups to visit the saltwater program cohesively. RCL owns three de Havilland DHC-2 Beavers on floats, probably the most famous bush planes in the world. “Cherry” is often the word used to describe their planes. Perfect for groups of 4 guests and 2 guides, you will fly in style and comfort with RCL. At certain times during the season, the lodge converts one of the Beavers from pontoons to tundra tires. The converted wheeled plane opens up a ton of territory simply not available otherwise. The lodge continues to locate new landing areas on coastal rivers and other inaccessible locations – a whole new ball game when compared to the limitations of the traditional float plane. Imagine strolling in a small clear river where nearly every cast brings a 5-pound Dolly Varden or chrome Silver Salmon. The wheeled plane provides the kind of flexibility to reach areas not considered by other lodges. Note that the wheeled plane may or may not be in use during your stay at the lodge. Rapids Camp Lodge operates on a Friday – Friday schedule. Guests first fly to Anchorage, Alaska, which is serviced daily by the major airlines. Most guests travel to Anchorage on Thursday and spend the night in Anchorage at one of our recommended hotels, continuing on to the lodge Friday morning. ANCHORAGE TO KING SALMON ON THE LODGE’S PRIVATE PLANE! On Friday morning, guests board lodge’s private plane for a 1 1/2 hour flight (285 miles) from Anchorage to King Salmon. The cost of round trip air between Anchorage and King Salmon IS INCLUDED IN YOUR TRIP COST. Upon arrival at the lodge, you will have time to unpack and get oriented before getting your fishing license, meeting your guide, and getting outfitted with any necessary gear. Travel to King Salmon on board the lodge’s private plane! Upon arrival at the lodge, you will have time to unpack and get oriented before getting your fishing licenses. That evening you will meet your guides and get outfitted with any necessary gear. Fishing days! Each morning begins with breakfast, served between 6:AM and 7:AM. After breakfast, get your gear and meet your guide. Planes depart from the lodge beginning at 7:30 – 8:00 AM. After fishing, planes, boats, and anglers return to the lodge between 4:30 and 5:30PM. Cocktails and hors d’ouevres are served before dinner, which is usually scheduled for 7:30PM. Guests at Rapids Camp are booked on a full week fly out package that includes six fly out trips if desired, although many guests prefer the local fishing on the Naknek, the lodge’s home water. Departure day. Guests check out of the lodge after breakfast and are shuttled to the King Salmon airport (20 minutes). The lodge’s private plane then delivers them back to Anchorage. There is no additional overnight required in Anchorage en route back to the lower forty-eight, and most commercial flights are “red-eye” overnight flights arriving home early the following morning. *On some occasions it is possible to fly directly through to King Salmon via Seattle, Washington with Alaska Airlines. Please inquire for details if you would like to avoid spending the night in Anchorage the Thursday prior to the Friday arrival at the lodge. 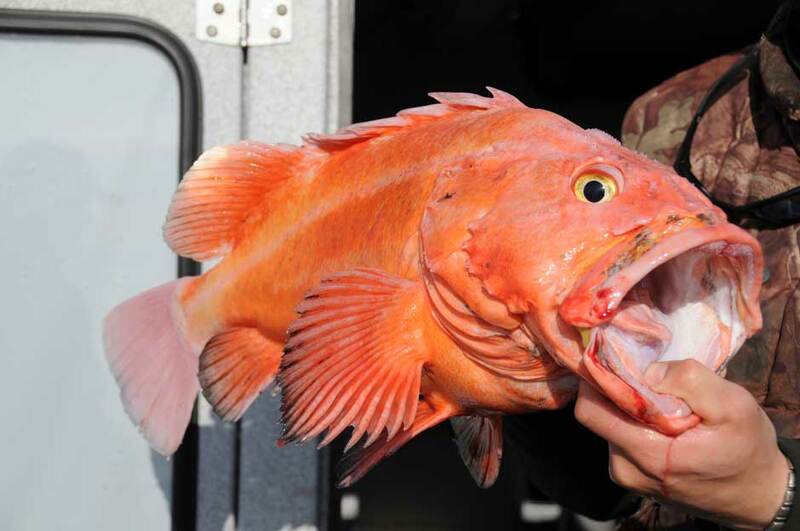 Choosing a date to fish anywhere in Western Alaska depends upon which species of fish you would like to target. Rapids Camp Lodge is open from early June through early October. Fishing is excellent all season, but the conditions and species available vary from month to month and may impact when you decide to visit. All months are excellent for viewing wildlife, and anglers often find themselves sharing the river or stream with multiple grizzly bears doing a little fishing of their own. Although fishing is the predominant activity at Rapids Camp, we encourage non-angling companions to visit the lodge as well. We frequently send families and small children to the lodge every season and it is a total homerun. Perhaps the best way to see Alaska’s gorgeous wilderness, scenery, and wildlife is on a fly-out fishing trip. Although daily activities are oriented around fishing, guests at RCL can detour to enjoy some wildlife viewing, visit an indigenous village, go on a hike, etc. Rapids Camp is by no means a pretentious “fly fishing only” program. Beginner anglers are welcome and encouraged to use spinning equipment instead of fly-rods if required to make guests more comfortable and successful. Get ready to see a lot of bears! Katmai National Park has one of the densest populations of brown bears in Alaska (more than 2000). 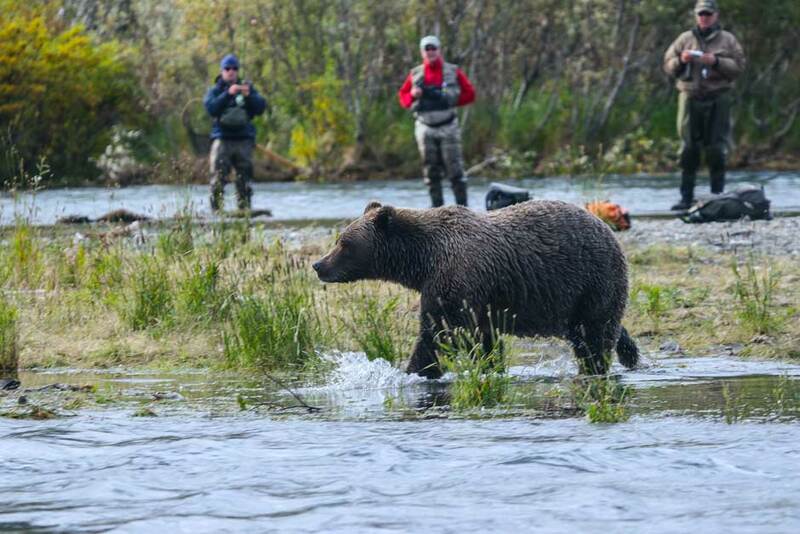 First time Alaskan anglers are blown away, but by the end of the week bears are almost an afterthought. Nearly every river system is flooded with brown bears during the annual summer run of salmon. You will share the river with bears doing fishing of their just about every day. Rapids Camp guides are well versed in bear etiquette, and will train anglers on the proper protocol when bears are encountered. Although the guides are armed with shotguns in bear country, bad bear incidents are rare in Alaska. Since 1996, Rapids Camp Lodge has not had a single run-in with an aggressive bear. Bears usually want to avoid a close encounter as much as you do, and they are a memorable and integrated part of the Alaskan fishing experience. Wildlife encounters and photographic opportunities are everywhere, including daily sightings of bears as well as wolves, moose, foxes, otters, bald eagles and a ton of bird life, plus all of the marine species associated with the saltwater fishing program such as whales or even orcas. Photographers and non-anglers will love the accessibility to these species provided by one of the largest fleets of aircraft in Alaska. 7 nights double occupancy accommodations at Rapids Camp Lodge; airfare to King Salmon, Alaska from Anchorage with the lodge’s private aircraft; 6 days guided fly-out fishing with shared guide; daily transportation via aircraft to rivers, streams, lakes, and wildlife viewing areas; daily housekeeping and midweek laundry service; three meals per day from a daily menu; all transfers between the King Salmon airport and lodge; use of chest waders, fly rods & reels, flies, tackle; preparation of all harvested game in approved shipping container for traveling home. Roundtrip airfare from your home to/from Anchorage, Alaska; accommodations while in Anchorage Thursday night prior to Friday arrival at the lodge (when applicable); alcohol at the lodge (with the exception of wine with dinner); applicable fishing licenses; use of lodge telephone and fax; souvenirs; all applicable gratuities (10-20% of trip cost is customary). Tailwaters Travel must adhere to the cancellation policies of the guides, outfitters and lodges which it represents. Rapids Camp Lodge’s policy follows: A non-refundable fifty-percent (50%) deposit is required at the time of booking to confirm all reservations. All trips must be paid in full 60 days prior to departure day.